1. Integration of newly installed position-hold sensors (laser altimeters, differential GPS) into the flight control system. 2. Optimizing the flight control laws for achieving the highest stability and position accuracy, even in non-zero wind conditions. 3. Running-in the AirMule’s mechanical transmission system and lift rotors. 4. Gaining more flight experience with the vehicle’s vane control system under actual full-scale induced velocity conditions which these tests are facilitating. Urban Aeronautics' AirMule ducted fan craft has been equipped with a wheeled landing gear to facilitate ground manoeuvring and to enable the unmanned air vehicle to perform short take-off and vertical landing operations. The Israeli company's prototype AirMule has recently been undergoing a systems upgrade, after having performed 40 test hovers and accumulated 10h of flight time. The upgrade activity has included the development and installation of the wheeled landing gear, which when used in STOVL mode has the potential to nearly double the aircraft's payload capacity. According to information previously released by the company, a skid-equipped AirMule has a maximum take-off weight of 1,090kg (2,400lb), including a mission payload of around 400kg. The AirMule is equipped with internal lift rotors and has a small footprint, qualities that make it suitable for vertical mobility in urban environments. The aircraft has multiple-mission capabilities, although the current emphasis is on unmanned casualty evacuation and cargo resupply tasks. Urban Aeronautics plans to resume flight tests with its prototype AirMule before year-end. 3 фото из Латруна 06.10.2010, в т.ч. таблица ТТХ. Был там 5.10, говорил с представителем фирмы и взял буклет, но до сканера не добраться. Ета хрень может лететь или на remote или автономно с помощью gps и сравнения вида местности. и радара осмотра земли. груз береться в 2 бортовые ниши - они рассчитаны на стандартные носилки - но должен сказать чт ето не для клаустрофобов. и скорее всего лучше чтоб траспортируемый был без сознания, потомы как лететь не видно куда и зная что ты летишь на автопилоте и рядом никого, потому что второй гр. отсек через мотор, с другой стороны... брррр. с другой стороны по их словам (сайта и представителя) на подходе 2-х моторный аппарат с пилотом и медиком onboard. Тогда Мула мозно будет использовать для доставки грузов тем частям где это будет оправдываться обстановкой, а мед эвакуацию делать большим аппаратом. пс. компания существует с 2002. В 2006 US NAVY (лама?) кинул им бабла. И только в последниые 2! года их поддерживает МО. Лично я впечатлился. Будущее за сеялкой веялкой с вертикальным взлётом. Вечерний рассказ оператора. "Что-то руки сегодня дрожали после вчерашнего, за день троих уронил, представляешь?" я поверю что этот вентилятор летает только когда лично увижу. ВО 1-х оно оказывается летало и очень давно. И не у нас. почему не реализовали уже тогда-везде пишут про трудности контроля (управления) потому как весч эта как бы аэродинамически неустойчива. Сегодня эта проблема решаема посредством компютеризирования процесса (fly by wire) и потому вернулись к теме. Во 2-х US Navy и тем более изр. МО на фуфло может и ведется, но денег не даст. А вообще Эта хрень, будучи доведена до ума, в чем я почти уверен, может занять нишу в которой сегодня ей нет конкурентов - эвкуация из мест откуда по другому никак. Например из горящей высотки (9/11). А потом, иди знай, сможет конкурировать и с вертолетами в их нише. Но Это уже будет здоровая конкуренция что выгоднее, а не "Это новее значит лучше". Кстати, неизвестно, чем легче управлять вручную. НО ИМХО не труднее чем вертолетом. А это нелегко. Хотя вибрации на air mule должны быть минимальны. Концовка интересная по решению но предсказуема по персонажу. И вот еще - ведь если аппарат впринципе UAV то должна быть у диспетчера кнопка Man/Auto которая отрубает подключенца, а дальше или на базу или ..., но сам. А если нет, то почему не отбомбиться и по базе? Статья по сабжу почти годовалой давности – в Бамахане №4, 22.01.2010. A Yavne-based company has produced a compact aircraft that can fly close to the ground and will hopefully be used by the military some day. Yes, sort of like Chitty Chitty Bang Bang. The future is here. The Second Lebanon War was etched in the collective memory as a traumatic event, not only because of the large number of casualties, but also because thousands of reservists found themselves in the field without food, water and ammunition. The Israel Defense Forces was afraid to send unprotected vehicles into Lebanon, since that would endanger their soldier-passengers. Sending in Yasurs (Sikorsky CH-53 transport helicopters ) was not always an option, since they could be shot at. The Jerusalem Post recently reported that the IDF is interested in procuring the AirMule, an innovative, compact, initially civilian aircraft that can fly close to the ground and above complicated terrain. This is the brainchild of Urban Aeronautics, an Israeli company based in the Yavne industrial zone. Pending receipt of a special budget, the defense establishment has asked the company to make several development-related changes in the plane to meet its needs. "When a small force is in enemy territory, surrounded by Hezbollah or Taliban fighters, the AirMule is particularly suitable for transporting supplies," says Rafi Yoeli, the founder and CEO of Urban Aeronautics. "Every combat soldier deployed in a forward post needs 20 kilograms of supplies per day. The AirMule's big advantage is that it reaches the destination quickly. Furthermore, thanks to its substantial payload and the design of the cargo bays, it can evacuate casualties. It can carry more than 500 kilograms for 50 kilometers, and return with enough spare fuel for 20 minutes of flight. "It can fly in gullies and does not expose itself to fire, which is an advantage compared to the helicopter and its big external rotor, which has to fly much higher in a hilly region. Another advantage the AirMule has over a helicopter is that a helicopter cannot land on an incline greater than 5-10 degrees, mainly because the rotor could hit the hillside. It's not that a helicopter cannot do tough jobs; a pilot knows how to get to complicated places. But the Second Lebanon War and the U.S. war in Afghanistan showed it takes the enemy a minute to shoot a missile at you." Scientists have been trying since the 1950s to develop a vehicle like this, mainly for civilian purposes, to overcome traffic congestion and fuel waste (see box ). The developers of flying vehicles drew inspiration from the helicopter, but they ran into one central problem: the rotor, which severely restricts where a chopper can go, especially in urban areas. The rotor is the primary factor in helicopter accidents: a slight impact can cause a crash, and in general it is dangerous for helicopters to cross high power lines. Yoeli says that this is why dozens of scientists and researchers tried to develop rotorless helicopters decades ago, but all of the designs encountered aerodynamic problems, such as instability, or could not exceed 30-40 knots. Behind Urban Aeronautics are several well-known investors and executives. The company's seven-member board of directors includes Ovadia Harari, formerly the deputy CEO of Israel Aerospace Industries, and David Ivry, who served as Israel Air Force chief, IAI's CEO and head of the National Security Council; he now presides over Boeing Israel. Roger Abarbanel sits on the board as the representative of an Italian investor partnered with billionaire industrialist Carlo de Benedetti. Maj. Gen. (res. ) Amiram Levin is on the company's advisory board. Yoeli, 59, is an aeronautics engineer by training and has a civilian pilot's license for helicopters and planes. He did his military service in the technical branch of the IAF, and from 1976 to 1983 worked at IAI, where he took part in developing Israel's first fighter plane, the Lavi. He also worked for Boeing Aircraft in the United States, mainly on developing drones and executive jets. After he left IAI, Yoeli went back to school and got a master's degree and a doctorate in aeronautics and artificial intelligence from the Technion - Israel Institute of Technology. In 1989 he founded Aero Design & Development Ltd., a company that was responsible for numerous aviation projects. 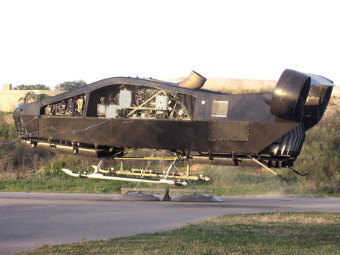 AD&D developed the applications for the Israel Electric Corporation's helicopters, as well as a series of aircraft, an unmanned aerial vehicle christened Skylark (renamed Skyrider by the IDF ), and a one-passenger aircraft called Hummingbird. "We abandoned Hummingbird in 1997 because it wasn't safe enough," Yoeli says. "In 2002, after we sold the company to Elbit, I had time to think about the product I would like to develop, and that was also when I examined all of the reasons why the aircraft I had developed was unstable. I sat down to write an orderly business plan - and that is how Urban Aeronautics was born." In 2002 Yoeli founded Urban Aeronautics with Mike Turgeman and 18 other employees. Turgeman had been heading the flight mechanics and control group at AD&D, and is now Urban Aeronautics' chief engineer. "The aircraft with internal rotors flew so badly that their development was suspended decades ago," Yoeli notes. "All the resources and attention were subsequently directed at helicopters, because it was clear they are the only aircraft capable of flying in urban areas despite the rotor obstacle. Developing an aircraft with an internal rotor was left to hobbyists. That didn't work either. "When I started Urban Aeronautics, our main dilemma was whether technology had developed enough in the past 40 years to build a flying car that does not face the constraints of the early models. Some of the problems have fallen by the wayside over the past 40 years. Now there are flight control computers that stabilize the aircraft, something that didn't exist in the 1960s; now extensive use is made of sensors, allowing planes to land in fog; the engines also work better, and every aircraft that Urban Aeronautics is developing, or is considering developing, has a turbo jet engine; there have been major developments in fuel efficiency and composite materials. Over the past eight years we have developed numerous aerodynamic solutions, so all the constraints the flying jeeps of the 1960s faced have been removed." Why is the rotor problem so significant? Yoeli: "When I started flying helicopters in 1997 I realized the extent to which a large rotor causes trouble. A helicopter pilot constantly thinks about where the blades are, and most of his flight hours are spent thinking about where the helicopter can fit. It goes without saying that flying a helicopter in an urban area crowded with buildings is out of the question." The company decided first off to forgo the rotor, and built an aircraft that has two internal rotors, and takes off and lands vertically. Last year the AirMule began test flights. So far it has performed 40 hovers; it does not yet fly between destinations. The folks at UrbanAero got it to hover in a 12-knot wind, and are hoping it will reach 60 knots in tests this year, and eventually fly at 100 knots. UrbanAero's goal is to develop a family of aircraft including the AirMule. Another aircraft is the Centaur, which has a single engine larger than the Mule's and can carry three to five passengers, including the pilot. The largest aircraft the company is developing is the twin-engine X-Hawk, which can fly five to eight passengers. UrbanAero is now focusing on the IDF as its first client: "That is because in Israel you can develop things quickly, and because we know the culture and the language," Yoeli says. "Elsewhere, such as at the Pentagon, relationships are heavy and awkward and not built on mutual trust. It is no coincidence that the IAF is ahead of other air forces in developing pilotless planes: The IAF invested in them many years before other air forces jumped on the bandwagon. We believe that the same thing will happen with our technology." "The obstacles of stability, speed and fuel efficiency. We overcame the speed constraint by creating openings in the front and the back of the vehicle, to allow air to pass through freely. We discovered that the reason the flying cars of the 1960s could not reach high speeds involved aerodynamic resistance. We created openings in the air duct, which streams air to the plane's engine, and thereby increased the speed potential to 100-120 knots. "If someone had invested more time in this back in the 1960s, he might have discovered that creating openings in the air duct increases speed. But as fate would have it - and this might also spell a business opportunity for Urban Aeronautics - the fact is that for the past 40 years the internal rotor issue wasn't addressed. "It may have something to do with us being Israeli: We constantly ask whether things can be improved, and challenge the assumption that something doesn't work until we have seen it for ourselves. In the American aviation industry, which is very conservative, nobody tried to address this subject, and nowadays it should be. "Another subject we developed is stability and flying in wind. We addressed this by installing drive flaps at the air duct's intake and exhaust openings. All told, the AirMule has 200 flaps: They move along axes and are connected to a central flight system. Through a system of sensors, the Mule corrects external disturbances and maintains stability. "All of our aircraft have a computer system that transmits data from the plane to the ground. We know where it is going, its speed, the gearbox oil's temperature, the fuel pressure and more." This is an exciting technological development. Why think small and only go in the direction of military and security applications? Why not be the Shai Agassi of flying cars? "We actually began with a vision for civilian flying cars, and we didn't just begin with that - we worked exclusively on this until 2007. We took as an example Sao Paulo, Brazil, where 500 helicopters bring executives to their offices each morning because the roads are congested and violent. We contemplated developing air taxis and flying ambulances. Until 2007 we collaborated with the American company Bell, and we raised money from the U.S. Navy to conduct a feasibility test." Then why did you stop developing a flying car for the civilian market? "In 2007 we held a series of meetings with representatives of the U.S. Navy and the Marine Corps. They told us they urgently need a way to transport logistical supplies and evacuate casualties. They suggested that we hold off on the civilian project and invest all our efforts in solving their problem. When you are running a high-tech company and a client comes in wanting to buy your product if you can meet his needs, you immediately change course. "Currently we are focusing on trying to show armies that our vehicle can transport several hundred kilograms of supplies and evacuate up to two casualties. We approached the Indian Army and the Italian Army, and they expressed interest in a vehicle like the one we're developing: a small craft that can land quickly and quietly anywhere; that flies quickly and eludes antiaircraft fire. "We are cooperating with NATO, which set up a group to draft standards for evacuating casualties. Here an interesting question arises: Should a lightly injured person be evacuated by an autonomous aircraft? Should it be used to transport a badly injured person, who might die? The answer is that the AirMule is best suited to transport people who are moderately wounded, because a seriously injured person could die for lack of an accompanying physician, and it is too risky to use on a lightly wounded person. With a moderately injured casualty, you have to risk an aircraft and evacuate him in any case, or else his life might be in danger. "The revolutionary thing is that for the first time NATO and the Israeli Medical Corps are even considering evacuating casualties in an unmanned aircraft. Everyone sees that, in the cruel reality of modern warfare, it is only a matter of time before this happens." Does the AirMule have additional uses besides evacuating casualties and transporting logistical equipment? "Yes, such as locating roadside bombs or identifying and monitoring biological warfare materials. Everyone today is scared of a dirty bomb or a terror attack using a dangerous toxin or chemical substance. We know how to fly the aircraft into danger zones, including urban areas. We can spray substances from the air and help put out fires. Our vehicle can carry a similar quantity to a small spray plane. It's not a lot, but it can fly at night and it can get close to the fire sources." How does the AirMule know what flight path to choose? "The route can be set from the control room based on coordinates. Anyone in the area knows the possible flight paths." Where do things stand in terms of the U.S. Federal Aviation Administration? "The good news is that the vehicle meets all the safety standards and will probably be cleared for use in rescue and military missions. I believe that once the Mule has proven itself, we will be able to obtain flight permits for 'civilian' tasks such as policing, firefighting and evacuating casualties." How much will an AirMule cost? "We estimate that a single vehicle will cost $1.8 million." "It will take a long time. We will need full FAA authorization, and that is a long way off. The vehicle is considered safe for military use, and the FAA has to see that it can be used for other purposes as well." Where does that leave you, from a business standpoint? "We plan to grow over the next two years and, among other things, to join forces with a strategic partner who will help us in marketing and sales." Is it reasonable to think flying cars are more than just science fiction? "It is certainly a valid and reasonable vision, which will be realized in the next few years. But it requires investment. In 2002 I couldn't have said this vision was valid. Now that we have finished developing the technology and it works, we feel differently. In the future every family will have an automatic urban aircraft with an internal rotor that can take off and land vertically." You currently are demonstrating flying crafts for customers. What will make them buy? "We will be demonstrating our technology to potential customers through 2012, and we hope that following a successful demonstration we will get the green light for full development and procurement, and we hope that this will happen first in Israel. In any event, in 2011 we will try to join forces with a strategic partner who will help us make the leap forward in marketing." Might you turn to venture capital funds? "We are being financed by private investors, and right now the project does not appear to suit venture capital. When the project began everyone thought we were completely nuts, but then we carried out tests in wind tunnels, we got money from the U.S. Navy to carry out a study. We flew vehicles. People started to grasp that there is something here." And what will happen if tomorrow several other companies develop flying vehicles? "We're currently the global leaders in this technology. Of course we are also trying to turn all of this into a financial success. I believe that eventually other companies will start developing similar vehicles, and together we will foment a major revolution. We cannot bring about this revolution on our own. The global market is huge." The idea of a flying car has fired up the imaginations of scientists and researchers since the 1950s. NASA, the U.S. Federal Aviation Administration and several universities tried to develop a flying car, but suspended the project in 2001. The Phantom Works division at Boeing Aircraft toiled over a flight system. While no one ever reported the project was stopped, it's also not known where it stands - or whether it produced viable results. Paul Moller developed the Moller Skycar M400, a prototype for a flying car that was capable only of hovering, but in 2006 its tests were canceled. Moller says several improvements were made to the Skycar in recent years, and its maiden flight is reportedly scheduled for 2012, but there is no guarantee this will happen. Another flying car, Parajet SkyCar, was developed by the British company Parajet. This vehicle is a sort of flying quad bike that can glide should the engine fail. In a test expedition by entrepreneur-adventurer Neil Laughton, the Parajet managed to fly across the Straits of Gibraltar, but hit a car upon landing in Morocco. Even though the vehicle was adapted for two passengers, it has only been able to fly with one. Following another failed test the inventors returned it to the workshop, and are now seeking public funding for further development. Another unique aircraft, called the Martin Jetpack, is not exactly a flying car but rather a flying jet device. It is being developed by the Martin Aircraft Company of New Zealand, and was shown for the first time in July 2008, after 27 years of development. Theoretically it can reach a speed of 60 miles per hour and an altitude of 8,000 feet. Urban Aeronautics has resumed flight tests of its AirMule vertical-takeoff-and-landing cargo and medevac unmanned aircraft as reports emerge that Elbit has won a Israeli defense forces contract to develop a cargo UAV dubbed the "Flying Elephant". Urban says the AirMule prototype is back in the air after a four-month systems and structural upgrade that added sensors, an energy-absorbing wheeled landing gear and modified the aerodynamics of the lower fuselage to improve control in gusty conditions. Initial test results are promising, the company says. While Urban is developing a ducted-fan vehicle that can take off and land vertically in confined spaces such as city streets, delivering cargo or picking up casualties, Elbit's Flying Elephant is a simpler wheeled cargo pallet attached to a servo-controlled, GPS-guided parafoil that can fly several kilometers to its delivery point. It sounds similar in concept to the CQ-10 Snowgoose unmannewd logotstics air vehicle produced by Canada's MMIST, but where the CQ-10 can deliver 600lb of cargo, the reports say the Flying Elephant will carry more than 2,000lb. Flight tests are planned for 2012. А когда же уже изобретут так полюбившуюся по С&C "Orca"? Я не понял только в чём новшество. В том что оно вертикально взлетает? Так есть же вертолёты. В том что безпилотник? Так по моему дешевле было переделать обычный вертолёт в беспилотник. По крайней мере перевозимым людям явно удбней будет. Да и когда техника на одной базе (унификация) это всегда в армии приветствуется.